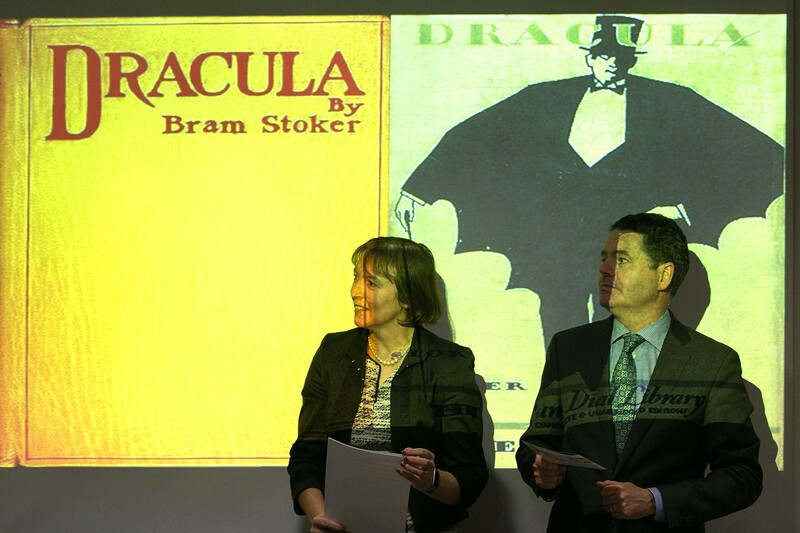 Deputy Governor Sharon Donnery and Minister for Finance and Public Expenditure and Reform, Paschal Donohoe, TD, await the official launch of Bram Stoker’s Dracula collector coin. Photos courtesy of the Press office of the Central Bank of Ireland. The Central Bank of Ireland has officially launched (24th October) their latest collector coin which is in salute to the work of Bram Stoker, author of one of the world’s most chilling novels: Dracula. As Halloween approaches, the Central Bank of Ireland has launched these commemorative coins in salute to one of the world’s scariest tales and the Dublin-born author who penned this famous novel. Glasnevin Cemetery provided an appropriate backdrop for the official unveiling, where Central Bank Deputy Governor Sharon Donnery presented some of the commemorative coin’s first strikes to Ireland’s Minister for Finance and Public Expenditure and Reform Paschal Donohoe, TD. Coin designer David Rooney was also presented with a coin at the event along with descendants of Bram Stoker’s family. The recreation of the Count himself in repose. Born Abraham Stoker in Clontarf, Dublin, on the 8th November 1847, his interest in storytelling likely began in childhood. Stoker was a sickly child, mostly bedridden and his mother entertained him with stories and legends from Sligo, which included supernatural tales and accounts of death and disease. Stoker published his novel Dracula in May 1897, but despite positive reviews, it was surprisingly not an immediate bestseller. It would not be until the 1931 American movie starring Bela Lugosi that the popularity of the book began to grow, and it has never been out of print since. 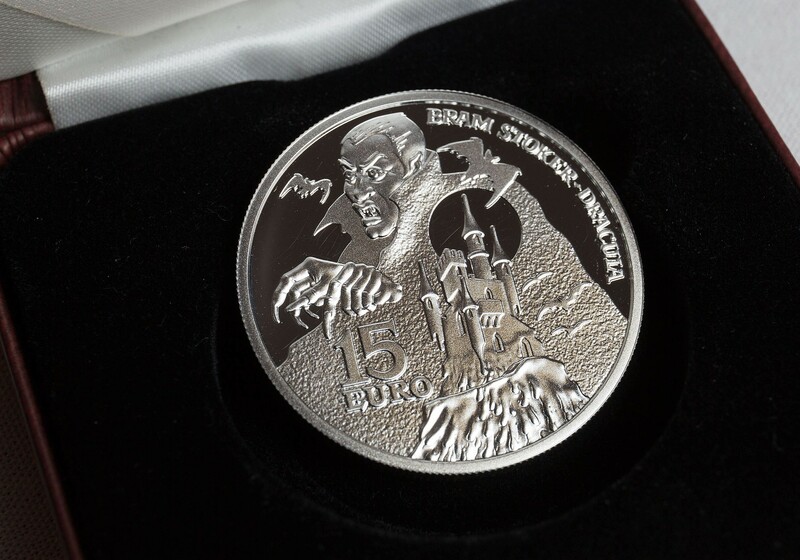 The Central Bank is delighted to be commemorating a renowned Irish author such as Bram Stoker with this €15 silver coin. 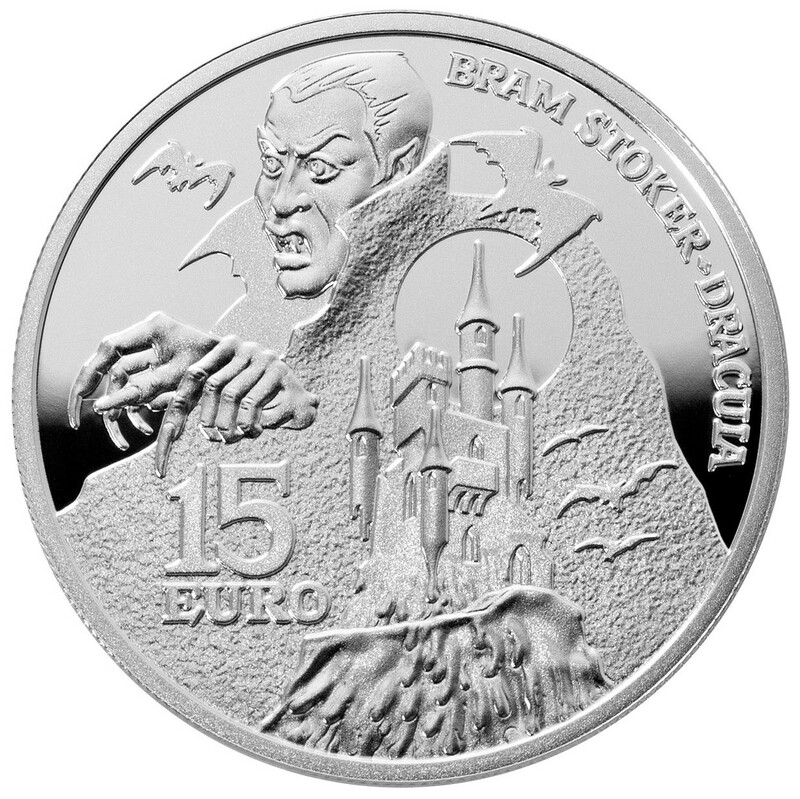 Bram Stoker created one of the most iconic characters in all of literature and film, and it is only fitting that we should honour him with this coin, which depicts the figure of Dracula looming behind his moonlit castle in Transylvania. 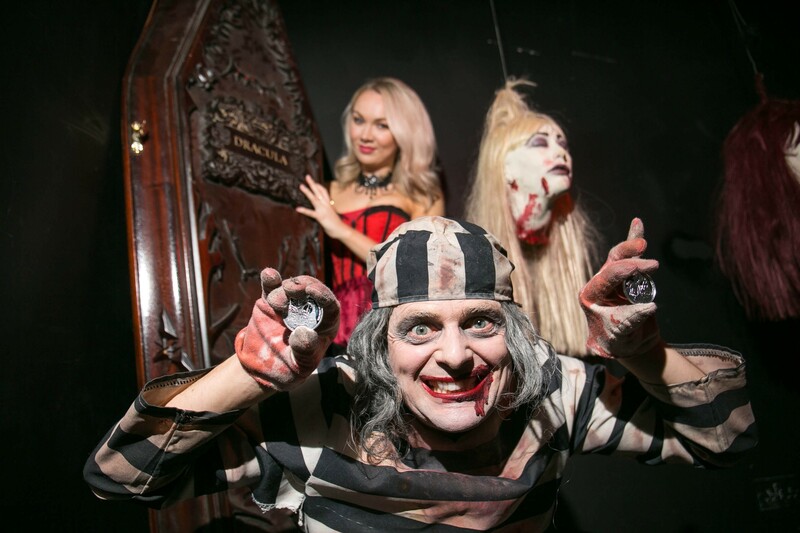 As one of the most recognised literary characters in the world, Bram Stoker’s Dracula has terrified and delighted audiences in equal measure for generations. It is fitting, especially at this time of the year, as we approach Halloween that Bram and Dracula are commemorated in this way. I am delighted to be here to mark this event with members of the Stoker family and would like to thank the Central Bank of Ireland for paying tribute to one of Ireland’s most revered authors in this way. 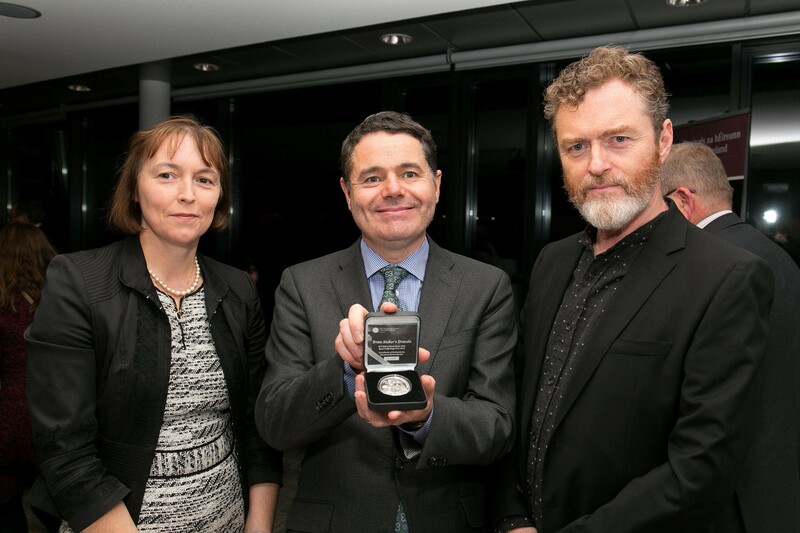 Deputy Governor Sharon Donnery and Minister for Finance and Public Expenditure and Reform, Paschal Donohoe TD are joined by author Dacre Stoker, great grand-nephew of Bram Stoker who all pose with the new collector coin. On behalf of the Stoker family, it is wonderful to see Bram commemorated in the city of his birth in such a magnificent way. I hope that his coin sells as well as his famous novel Dracula has around the world. 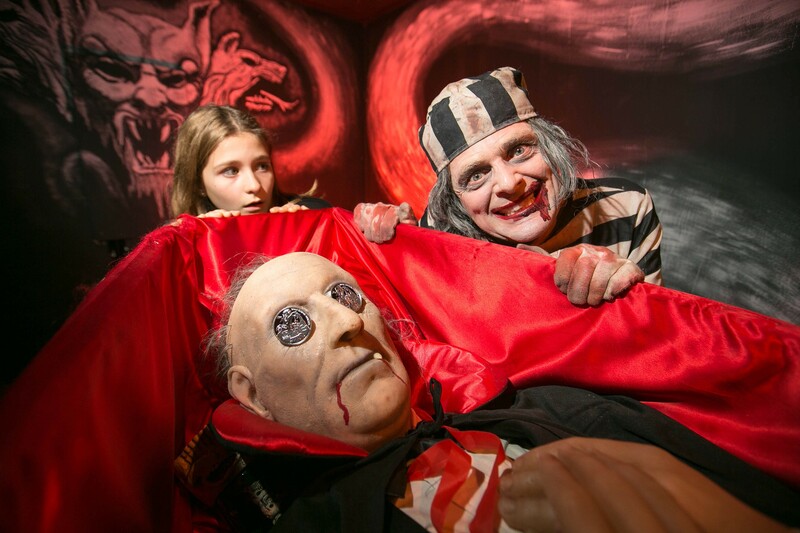 As part of the launch, some theatrics were also included, courtesy of the Glasnevin Cemetery and some ghoulish costumes! Aside from his notoriety as the author of Dracula, Stoker enjoyed a career as the personal assistant of well-known actor Sir Henry Irving and as the business manager of the Lyceum Theatre in London, which was owned by Irving. He was married in 1878 to Florence Balcombe, a celebrated beauty in her day, and a year later their only child, Irving Noel Thornley Stoker (1879–1961), was born. It was believed that his meeting with Ármin Vámbéry, a noted Hungarian writer and traveller, that Stoker may have become inspired to write his novel Dracula after hearing Vámbéry’s dark stories about the Carpathian Mountains. Stoker would embark on several years of personal research about European folklore and mythological stories of vampires, though he would never visit the lands where his best works were staged. Stoker died in London on the 20th April 1912, at the age of 65. He was cremated with his ashes being placed in a display urn at Golders Green Crematorium in north London. His legacy to the genre of Gothic horror literature is essentially set in stone. His influence and the original storyline have sparked many to replicate the stories of vampires and the “undead.” To date, more than 1,000 novels and a staggering 200 films have been made about the vampire Count Dracula, making him the literary character most often portrayed in film history. The silver Proof quality collector coins are produced by the Mint of Poland at their facilities in Warsaw on behalf of the Central Bank and are designed by artist David Rooney. The obverse side depicts one of the most familiar images of the Count, which is acutely influenced by the early cinema depiction of Nosferatu and Hammer Horror cinema posters from the 1960s. The figure is seen looming in front of the moonlit castle with a reference to bats, often attributed to vampires transforming themselves into the flying creatures at will. The denomination of 15 EURO is placed just to the lower left of the depiction of the Count. 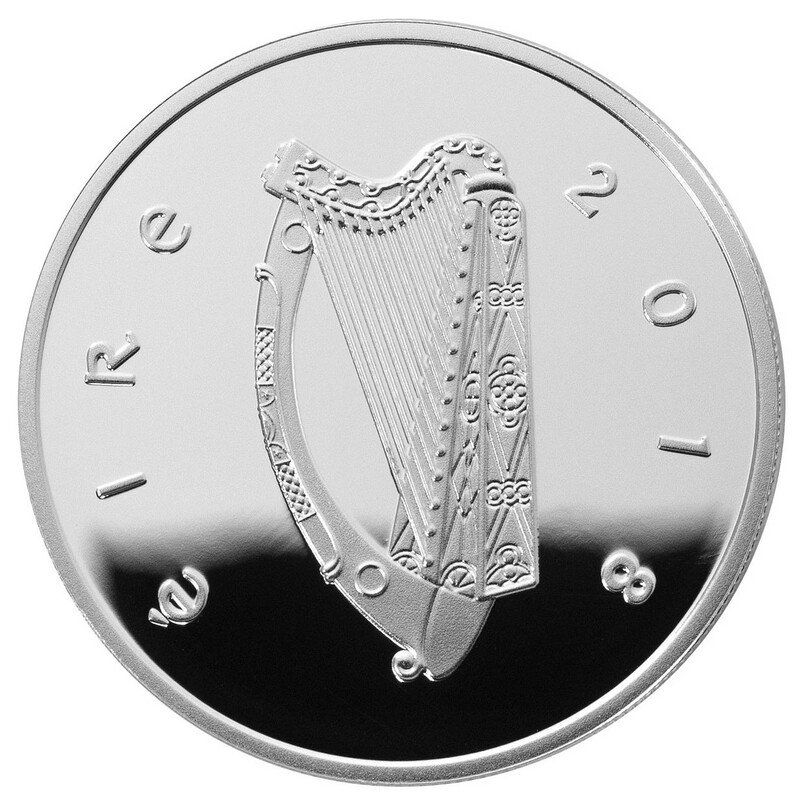 The reverse side of the coin includes the national insignia of Ireland, the harp, with the text EIRE and the year of issue 2018 placed on either side. The coin is displayed in a custom case and is struck in Proof quality. The coins are encapsulated and presented in a custom case branded with the logo of the Central Bank of Ireland and are accompanied by a certificate of authenticity. For more information on this coin and others available from the Central Bank, please visit their website. It is expected that there will be great interest in this particular coin, so the currency centre is advising buyers to order quickly to avoid disappointment. Excellent Michael, fabulous ceremony and as I can see the launch was done in style. I think one thing that affects such themes ( I love this coin ) and coins is being so popular, there are many private token makers who have already flooded the market with on same theme. In this case, if you search on internet , you would find many such silver tokens / medals of Dracula. hopefully this wouldn’t affect the popularity of this coin. Any views Michael ? Glad you enjoyed the coverage – the Central Bank always make an effort where their launches are concerned, I wish other Mints or Central Banks followed suit. I think there’s something to be said for originality and in the case of this coin, as Bram Stoker was an Irishman and it may have been the case that he learned his talent for storytelling as a child in Dublin, the only logical or definitive coin to have as tribute to the author and the novel is from Ireland – coupled with the unusual design, I think the coin will sell out much the same way the Rory Gallagher coin did – I’ve already got mine..! Good to know that you have received yours and I hope this coin does well with collectors. That is such a cool coin! I often find interesting ones on https://bullionexchanges.com/catalogsearch/result?o=dracula&q=drachmai. I am thinking of getting this!